Hello friends, with cooler temps here I love using the crock pot. 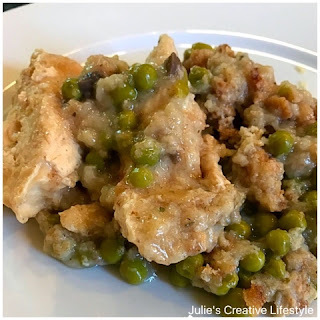 I have an easy to make crock pot chicken and stuffing recipe to share with you. It makes the perfect back to school dinner idea. I was looking for a crock pot recipe to make that had chicken and stuffing in it. So after searching Pinterest, I came across this recipe HERE, and it looked really good and easy to follow. I have made this crock pot recipe about four times already and my family just loves it. I made this recipe in the past using green beans like the recipe calls for and it tasted really good. This time when I made the chicken and stuffing, I realized that I did not have any green beans, so I used one can of drained and rinsed peas instead. 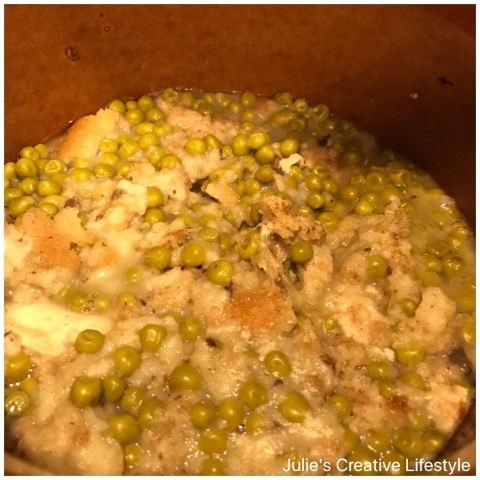 My family happens to like this recipe better with the peas. I also did not have any sour cream on hand and I used water in place of it and the recipe still came out great. This crock pot recipe is an easy one to make any time of year and the perfect week night meal. If you are making this crock meal around Thanksgiving, then you can just substitute the chicken for turkey. By the way, the crock pot you see featured in the photo above, was from my mother-in-law, which she used to use. The crock pot is at least 40 years old and still works great. I had an oval shaped crock pot that I loved but the top broke. I still wanted to use the crock pot, but have the lid replaced. My problem was that the company that makes the replacement lids does not make my lid anymore or the crock pot. So that is why I'm using this crock pot and I love it. I hope you all like this recipe as much as my family. 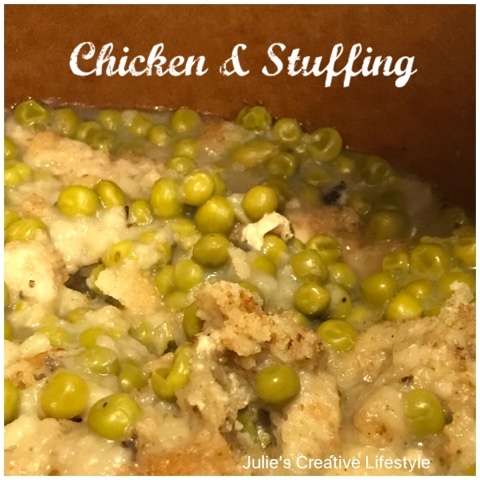 This is an easy way to make chicken and stuffing in the crock pot. Spray the crock pot with non stick spray. Place defrosted chicken in the bottom of the crock pot as your first layer. Open stuffing mix and pour the dry mix over the raw chicken. In a separate bowl, mix together the soup and sour cream. Top this mixture over the dry stuffing mix. The last layer will be the frozen green beans or peas. Now add about 1 cup of water to the top of this mix. Cook on high for 4 hours or cook on low for about 7 to 8 hours. Tip: About half way between the cooking time, use a fork to fluff the stuffing mix. This will allow the water to drop through the soup mix and create a steam to cook the stuffing. Add less water if you prefer a dry stuffing or add more water if you like it really moist. Let me know if you make this recipe and how you liked it. I changed this recipe around a little bit but I found it HERE. Thanks for stopping by and enjoy the end of the week and weekend. Jess and I will see you all on Monday for our Cooking and Crafting with J & J Link Up! 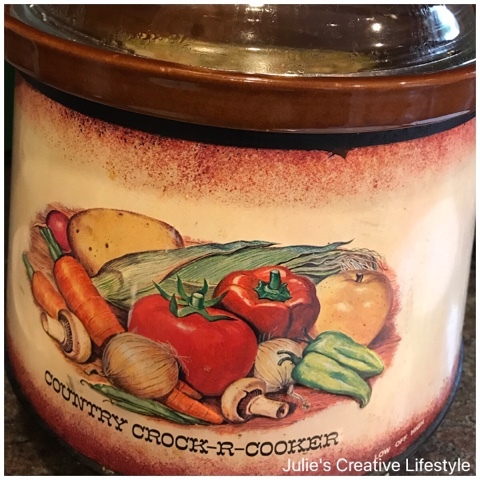 I love your retro crockpot! I've commented on it before! That meal looks delicious! I bet the house smells so good when it's cooking. That's easy n delicious recipe..
Looks good Julie...especially for fall!! That would be pure comfort food for me! On the day the hurricane blew in, we got up early and put a roast and veggies in the crockpot. We were happy to have it that evening when the wind and rain got worse. Hugs! I'm not at all surprised your mil's crockpot still works well ;). Thanks as always for the recipe Julie. Our crockpot is loaded up in BAM (taking off today) as I never use the oven for some reason so it comes in handy. I have that same crockpot and the lid broke! I have kept it hoping to find another lid....I have seen them at thrift stores. Just forget to take the measurement of it with me. This sounds like a great recipe to make in it! This sounds yummy. I love chicken and stuffing. Now I have an excuse to get out the crockpot! Julie - That looks good. I love those crockpot things for the nights I have the kids here and need to feed them. I would substitute broccoli for the peas though because NONE of my kids like peas! Crazy, huh? I can't wait to make this Julie! Sounds divine, and so easy~ my husband will LOVE it!